The 80th annual Alaska State Fair, now in full swing until Sept. 5, is a longtime favorite among locals and visitors alike. 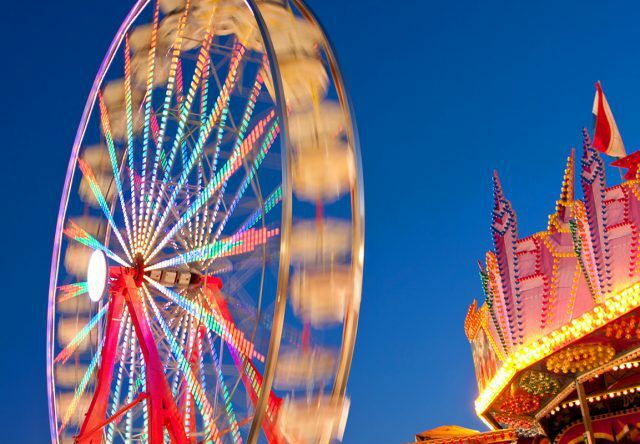 Located in the beautiful Matanuska Valley and surrounded by farmland and stunning mountains, the fair features carnival rides, delectable food, live entertainment, farm animals, record-breaking produce and more. If the fair coincides with the end of your trip – or even the beginning – it’s the perfect spot to find a memorable or funky item to take back home with you. You’ll have the best time perusing fair vendors for something uniquely Alaskan; here are just a few ideas to be found at this year’s festivities. Alaska pottery, jewelry, crafts and more are sold along the winding and color-coded moose-tracked paths at the fairgrounds. A locally crafted coffee mug is a fantastic way to wake up each morning with memories of your trip to the Last Frontier, or if you’re interested in handmade jewelry or a print from an artist in the area, you’ll find those gifts nearby too. For something stylish, stop by vendors like Blush Boutique or Alaska Starfish Co. Blush Boutique rolls out its extremely popular Rebel Yell hoodie around this time each year, and the Alaska-themed sweatshirt usually sells out within just a few days due to a highly anticipated new design every year, as well as the quality and coziness of the sweatshirt. Alaska Starfish Co. has all sorts of wearable, original Alaska products including leggings, hats and artistic T-shirts. Another classic hoodie to bring back from your vacation is the “Alaska Grown” sweatshirt that you’ve likely seen around if you’ve spent more than a few days in the state. Emblazoned with the agricultural Alaska Grown logo, it’s a fun way to commemorate your time in Alaska. Alaska-made honey and syrup are a tasty way to bring a part of Alaska back home, and the Alaska State Fair is a place to find these types of products from across the state. Fill your carry-on bag with Alaska honey sticks – they’re under three ounces each and if you don’t eat them all on the airplane home, they’ll be well-received as gifts. Also, if you’ve never tried Alaska birch syrup, give it a taste and prepare to never be satisfied by the maple variety again. You may think you’ve outgrown it, but you simply can’t leave the Alaska State Fair without a wax mold of your hand. The booth at the Alaska State Fair has been cranking out quality wax hands for years and is a can’t-miss stop before you depart. Whatever you decide to bring back home, a trip to the Alaska State Fair is a worthwhile stop to load up on Alaska gifts for your family, friends and yourself.